Many people who suffer from depression have a hard time understanding why. As mentioned earlier it is not an illness that you can really reason with. Of course, a lot of the time there will be several reasons behind ones depression but equally a lot of the time it can be very hard to pinpoint exactly why it is you feel this way. In this section, we are simply going to take a look at some of the more common reasons people suffer from depression to gain a better understanding of why you may be suffering from it too…Circumstances Circumstance is in my opinion the biggest cause of depression. It would be impossible to cast the net over one circumstance that affects us the most because everyone lives completely different lives and it is for that reason that circumstance can play a huge part in suffering from depression. For example, many of us have financial problems. We now live in very difficult times where jobs are harder to come by and everything is ridiculously expensive if you’re not earning a good salary. Although money is not everything a lot of people suffer from depression because they simply don’t have enough of it to have a good time. In other scenarios the death of a close friend or family member could be the circumstance. Death is something that we all have to learn to deal with in our own different ways and a lot of the time depression is used as a mourning technique. Depression is often caused by significant changes in one’s life. When the pendulum swings against you it is very hard to understand why and it is for this reason that many of us struggle to cope. I am not suggesting that all depression is caused by people living on easy street and then falling on hard times but it does happen and a lot of the time we are powerless to affect the outcome of these changes. Loneliness sort of comes hand in hand with depression. If you’re feeling down then you probably don’t feel like interacting with people who all seem to have “perfect” lives and therefore it is very easy to enter a state of loneliness. If you feel you have not seen a lot of people lately then your morale will be suffering and you should do everything you can to change this. Of course, some of the time loneliness leads to depression when one loses a powerful relationship in their life. If this has happened to you then it is completely natural and whilst you may feel alone, you are not. Anxiety is another factor that leads to depression. If you suddenly start to be fearful of an aspect of your life then it is very easy to slip into a state of depression and avoidance. 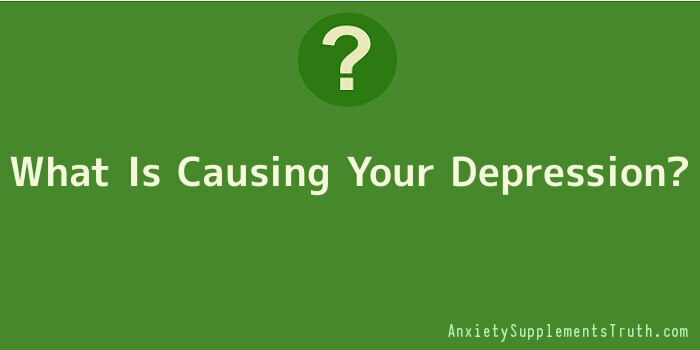 Typically, depression caused by anxiety stems from problems with finances, work or family. If your depression is caused from anxiety then I recommend you try and tackle the problem head on. The longer you leave it the harder it gets.